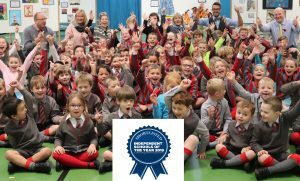 Ghyll Royd School pupils are celebrating as their school has been shortlisted as one of the best Prep Schools in the country. The Independent School of the Year Awards was set up this year by Independent School Parent magazine. The awards showcase school success stories and celebrate the student services they provide. Ghyll Royd School is one of five shortlisted schools, the only school north of London to be nominated for the Prep School Award. The criteria for the Prep School award include exceptional specialist teaching, individual student stories and the impact teachers have on the wider student experience. Ghyll Royd has been shortlisted for its success in local sport, its dedication to the creative arts and outdoor curriculum and the whole school’s commitment to providing a happy and warm place to learn. The School is on its way to becoming the first in the area to be awarded Platinum status in both the Arts (Artsmark) and in its outdoor provision (Woodland Trust Green Tree Schools Award). The School has had a brilliant start to the school year. On the back of their successful 100% pass rate in the May SATs exams, former pupils have settled very well in to their secondary schools of choice which include Ermysteds, Skipton Girls High School, Bradford Grammar School, Ilkley Grammar School and Menston St Mary’s. A brand-new cohort of Reception pupils started big school in September and have been enjoying the many benefits of an independent education. Mrs Hudson’s Reception class have impressed with their super handwriting and Mathematics, their participation in Music and their language ability in their Spanish lessons. The latest Early Years baseline assessments show that all the children who joined Reception from Ghyll Royd Pre-School are working above the national average in state and comparison Prep Schools. The award celebrates student success which reflects on pupil and parent satisfaction. In a recent parent survey, 100% of responses say Ghyll Royd School meets their child’s pastoral and welfare needs effectively and the school does it all it can to ensure their child learns in a healthy and safe environment. All parents surveyed said that the school’s teaching enables their child to make good progress and develop skills for the future and their educational needs are met. Headteacher Mr David Martin is delighted with the news. Since his appointment to Headteacher in 2014, he has been working hard at developing the school’s art and outdoor curriculum. He said: “To be nominated for an award is one thing but to be the only prep school in the North of England shortlisted is an incredible achievement. Winners of the Independent School of the Year Awards will be announced in December.